and Communities to Better Health. NE AHEC Program represented in Arlington, V.A. The National AHEC Organization (NAO), a national membership organization that serves Area Health Education Center (AHEC) program offices and centers, hosted the 2018 NAO Conference in Arlington, V.A. from July 8-11. The Nebraska AHEC Program, along with forty-five additional state programs, working to address the Nation’s health needs by recruiting, training, and retaining a diverse workforce of health professionals committed to the transformation of health care, especially in the country’s rural and urban underserved communities attended the conference. During the conference, sessions addressed three priority areas: improving workforce distribution, increasing the number of diverse and culturally competent primary care providers, and supporting health care practice transformation. Sessions, spread throughout the three-day conference, offered attendees opportunities to hear from leaders across the states and learn best practices to address the priority areas. Northern Nebraska AHEC (NNAHEC) shared their strengths and expertise on topics of maximizing the use of volunteers as well as the work the center does related to NAO Human Papillomavirus (HPV) Immunization Project. Additionally, NE AHEC presented as part of a collaborative session on how to build collaborative partnerships and spoke to the development of the Midwest Learning Collaborative (MLC). MLC is a partnership with South Dakota and Missouri AHEC programs to deliver easily accessible continuing education webinars for clinical partners and health profession students. Furthermore, Nikki Carritt, Deputy Director and Program Manager for the NE AHEC Program was elected to lead the NAO Program Director Constituency Group as Chair. During the conference, Captain Jacqueline Rodrigue of the Health Resources and Services Administration (HRSA), part of the U.S. Department of Health and Human Services, addressed attendees on behalf of Dr. Louis Padilla, associate administrator for HRSA. HRSA invests their dollars on programs that impact the diversity, distribution, and practice transformation of the next generation of the health care workforce. Captain Rodrigue spoke of AHEC’s valuable role within HRSA and the Bureau of Health Workforce (BHW), as there are 261 regional centers across the country creating strategic partnerships, leveraging resouces, and serving from pipeline to practitioners. Captain Rodrigue also shared that the $8 million increase the AHEC Program received from Congress for FY18 will be distributed as supplemental funding to address opioid use disorder diagnosis, prevention, and treatment. Conference attendees also used their time in the Washington D.C. area to advocate for AHEC on Capitol Hill. Nebraska AHEC staff met will all members of Nebraska’s congressional delegation or their staff to inform them of the vital work that the NE AHEC Program is doing to address Nebraska's current and future health workforce needs. Additionally, NE AHEC staff attended the Nebraska Breakfast, the seventy-year-old tradition of allowing constituents to spend time with the entire delegation. 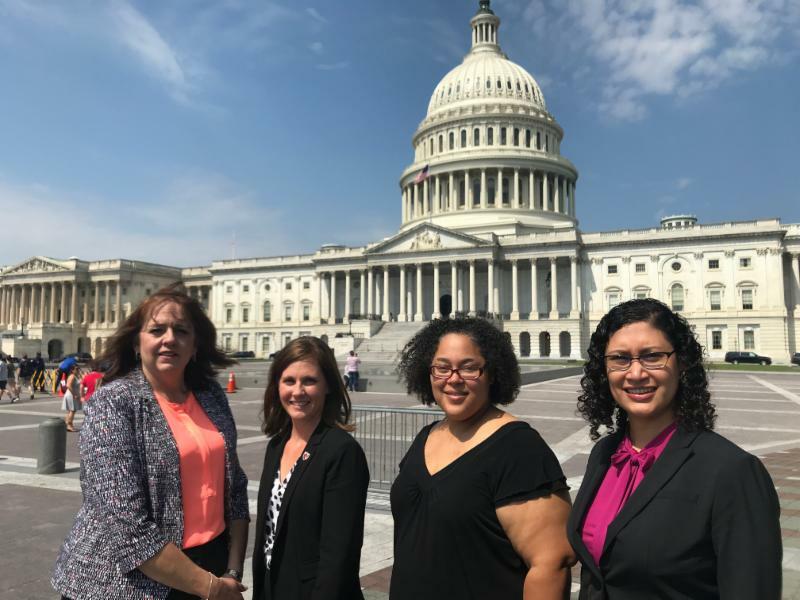 (Pictured Above: Gretchen Forsell, NNAHEC Executive Director, Nikki Carritt, NE AHEC Program Office Deputy Director and Program Manager, Liza Arellano, Omaha AHEC Executive Director, Carmen Chinchilla, SE NE AHEC Program Director in front of the U.S. Capitol). 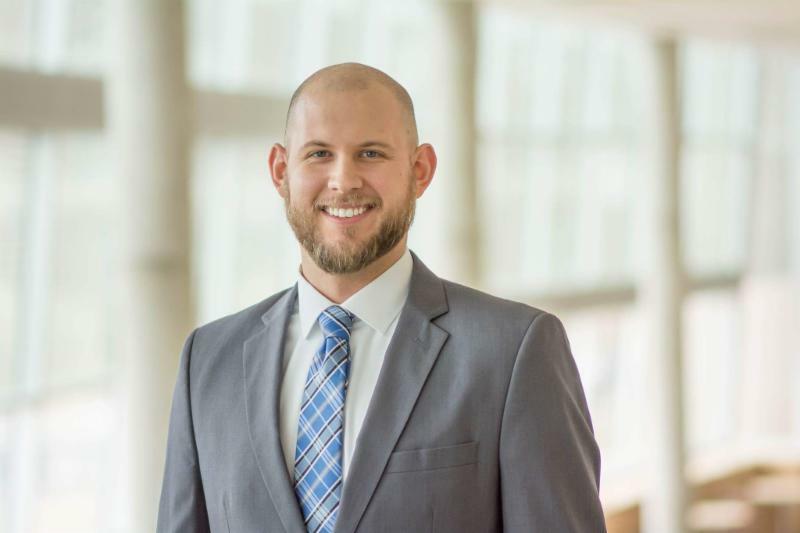 Sam Woodruff recently joined the Nebraska AHEC Program Office at the University of Nebraska Medical Center (UNMC) as the AHEC Program Associate. 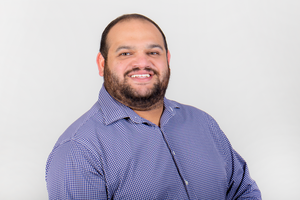 Sam will assist with budget development and maintenance as well as administrative support. Additionally, Sam will help advise UNMC’s Student Association of Rural Health (SARH). Sam is a recent graduate of the Master of Public Health (MPH) program at UNMC, with a concentration in Health Administration. During his time as a student at UNMC Sam was heavily involved on and off campus; leading the University’s Student Delegates group, working as a graduate assistant with Nebraska Medicine’s Primary Care Department to attain Patient Centered Medical Home accreditation. During his time as a student, Sam also assisted with research initiatives within the College of Public Health. Sam received his Bachelor of Science in Kinesiology and Health from Iowa State University. Welcome, Sam! You can reach Sam by email at samuel.woodruff@unmc.edu or by phone at 402-552-7725. The NE AHEC Scholars Program is accepting applications for eligible health profession students until September 12, 2018. The Program provides enhanced training and opportunities for health profession students interested in providing health care in rural and urban underserved areas of Nebraska. NE AHEC Scholars will be better prepared to enter the workforce with the skills necessary to meet the needs of rural and urban underserved populations. In addition to their health profession training program, selected applicants participate in a two-year supplemental program that includes 40 hours of didactic and 40 hours of community-based clinical experiential training each academic year. Scholars will receive a formal certificate and letter of completion as well as eligible for up to a $200 stipend annually. Click here to learn more and apply! 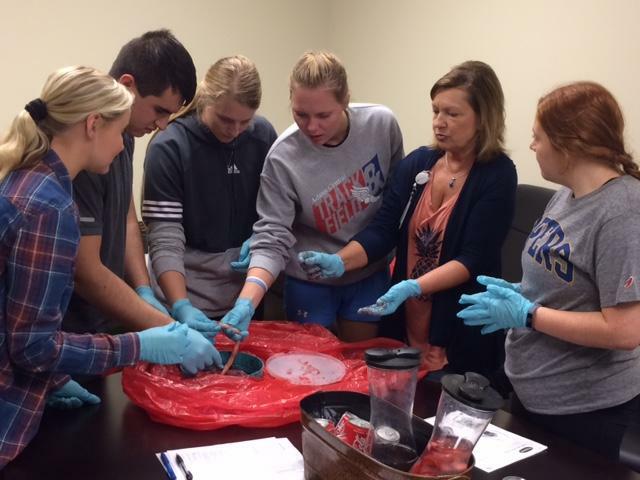 From June 4 to July 6, 2018, Central Nebraska Area Health Education Center (CN AHEC) and the University of Nebraska at Kearney (UNK) Health Sciences Department partnered with the UNK Biology Department to offer an Academy for high school seniors interested in health professions. The Academy, a five-credit college course coordinated by CN AHEC, introduced students to the following health professions: physician, physician assistant, athletic trainer, medical laboratory scientist, nurse, radiographer, physical therapist, and occupational therapist. Students participated in a multitude of interactive, hands-on experiences during the five-week course. In thanks to the UNMC Kearney campus faculty from the College of Allied Health and College of Nursing, students ran blood and urine tests, listened to each other’s lungs using stethoscopes, practiced administering shots, dissected a human cadaver on an anatomage table (a 3D imaging table), positioned X-ray equipment, and trained on the simulation mannequins. New West Physical Therapy and Sports Medicine of Kearney, in partnership with the Academy, demonstrated physical therapy and occupation therapy rehabilitative activities of electric stimulation, band exercises, and wax therapy. Activities were supplemented with additional information and education requirements of the various health professions. Michael Blaha, Mitchell Schmidt, and Charles Treinen, third-year UNMC medical students out on their rural rotations, shared advice on what classes to take and experiences of medical school with the students through a panel discussion. Additionally, the students learned about athletic training opportunities from the exercise performance lab faculty at UNK. 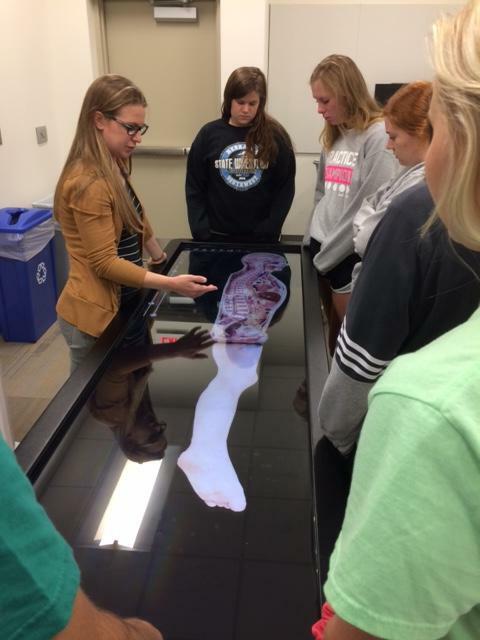 During a visit to Kearney Regional Medical Center, students heard learned about being a physician assistant hospitalist, observed stress tests, watched a nuclear medicine technologist conduct patient scans, and learned about women’s health through by interacting with a human placenta. At the end of the Academy, students reflected on their experiences of shadowing and researching health professions. Shelby Shoemaker of McCook, NE, shared that she was initially interested in becoming a physician assistant, but changed her mind following the hands-on activities from the medical laboratory science introductory case study and shadowing her hometown medical lab scientists. She stated she now plans to pursue medical lab sciences as her future health career. Through extensive partnerships and collaboration, CN AHEC’s first Academy was a success. More than ten years ago, Northern Nebraska AHEC (NNAHEC) identified a community need they could help address. Northeast Community College Physical Therapist Assistant (PTA) program noticed that students enrolled in their programs were starting classes with insufficient and sometimes incorrect career knowledge about the field. In looking for a solution to prevent turnover in already small class sizes, the PTA program determined that requiring applicants to job shadow prior to application and enrollment would close the gap in knowledge and clear up any misconceptions of what a job as a PTA entails, said Laura Schwanebeck, Northeast Community College PTA Program Director. NNAHEC had an award-winning job shadowing program already, and the natural partnership was formed. NNAHEC acts as a central processing center that streamlines the job shadowing process coordinating paperwork and pre-requirements, such as students passing an exam on the Health Insurance Portability and Accountability Act (HIPAA). Additionally, NNAHEC works to cultivate relationships with shadowing sites and schedule the experiences to comply with the PTA program’s requirements. Over the years, the PTA application process has evolved to include specific information and instructions on the Northeast Community College PTA’s program web page that highlights NNAHEC and the job shadow requirements. Currently, each student who applies must work with NNAHEC and complete eight hours of shadowing in an outpatient setting and eight hours in an inpatient setting. Enrollment in Northeast Community College’s PTA program is limited and highly competitive requiring students to submit letters of recommendation, essays, and proof of their job shadowing, among other criteria. The PTA Admissions Committee invites top-scoring candidates for an interview. Twenty-four students are accepted each year. 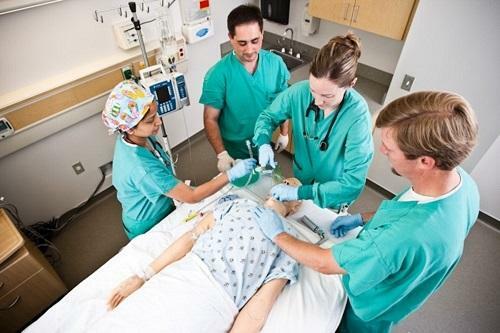 The partnership between NNAHEC and Northeast Community College extends to some of the college’s other health care-related programs and activities as well. “Our partnership with Northeast has been mutually beneficial over the years, and we look forward to continuing to reap the rewards in the years to come,” said NNAHEC Director Gretchen Forsell. Over the past year, Nebraska Panhandle AHEC (NP-AHEC) has worked with 88 eighty-eight students in their job shadowing program. Many students participate in a job shadow to learn if a career in health care is something they want to pursue. NP-AHEC offers job shadow experiences in birth and infant care, emergency medical services, neonatal intensive care unit, nursing, physical therapy, radiology, and surgery. To participate in a job shadow experience, students must meet several requirements. In addition to being at least 16 years old, students must learn about the Health Insurance Portability and Accountability Act (HIPAA) and successfully pass an exam. Shadowing experiences can occur at any point throughout the year, but many find more availability in conjunction with their school breaks. Shadowing allows students to ask questions, observe health professionals, and develop hands-on skills to help them make informed choices regarding their future education and pursuing a health career interests. NP-AHEC also offers an in-depth trauma shadow experience. The experience, open to a limited number of individuals, simulates an accident victim’s journey through the emergency medical services system. Throughout the three-hour simulation, students meet with medical staff and services in Scottsbluff, NE. Students meet with Regional West Medical Center’s Air Link ambulatory services, emergency department, imaging services, laboratory services, operating room, and morgue. The simulation concludes with visits to Valley Ambulance and Dugan-Kramer Funeral Chapel & Crematory. 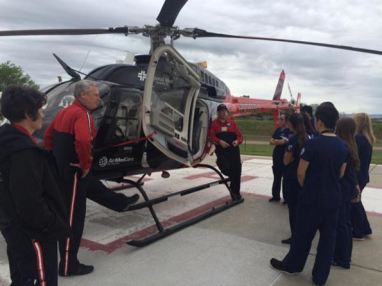 During a recent trauma shadow experience, two students commented, “I enjoyed seeing Air Link and the other departments involved in a trauma. I liked going to the funeral home too. It was an unexpected part of the tour and, I found it very informative. I never knew the process before this experience,” and “I enjoyed seeing the flight for life unit and the ER. Emergency services are where my interests are.” Connecting students with these vital experiences expose them to unfamiliar situations while demonstrating the daily responsibilities of health professionals. For more information, please contact, Kelsey Miller , NP-AHEC Job Shadow Coordinator. 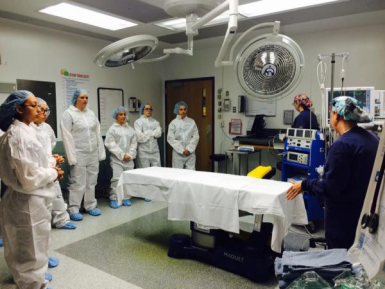 (Pictured Above: Students observing the operating room during the trauma shadowing experience). (Pictured Above: Students observing the Air Link ambulatory services during the trauma shadowing experience). Southeast Nebraska’s Area Health Education Center (SE NE AHEC), hosted by Public Health Solutions District Health Department began partnering with Lincoln’s Bluestem Health (formerly known as People’s Health Center) in May 2018. Bluestem Health is a Federally Qualified Health Center (FQHC), a community-based health center that receives public funds to provide primary care services in underserved areas. At Bluestem Health, community members can find medical, dental, and behavioral health services, regardless of ability to pay. Their model of care serves as an example of how integrated care can positively impact the patient and the community . Bluestem Health’s Chief Medical Officer, Dr. Michael Israel, believes his role is an ambassador to the community to help train others in their pursuit of a health career. Dr. Israel will work with the SE NE AHEC by providing the opportunity for two medical student rotations per year at the Thompson Clinic where he practices. Working with Dr. Israel will provide students a unique opportunity to work in an integrated care model facility, particularly one with integrated behavioral health services. As a FQHC clinic, students will be exposed to a wide array of patient needs and the barriers they face. Some patients experience barriers when accessing health services such as lack of access, inability to pay for the cost of services, or a lack of transportation. As a result, patients may not have had a physical examination for several years. In these instances, care providers need to be more involved, not only to address their physical concerns, but also to address the issues that may prevent the patient from leading a healthier life. During the rotations, students will also be exposed to the diversity of patients that utilize Bluestem Health's services, providing the opportunity to engage with different cultures and develop awareness of how cultural practices can impact the health of a patient. These experiences are essential as future health care providers with additional knowledge and experiences in this area may be better equipped to work with Nebraska's changing and diverse population. SE NE AHEC is excited about the new relationship with Bluestem Health and the impact it will have on the future providers in the southeast region, and Nebraska as a whole. Interested medical students should contact Carmen Chinchilla, SE NE AHEC program director, to arrange a rotation at the Thompson Clinic. If you would like more information on anything included in this newsletter or about opportunities to partner with the Nebraska AHEC Program, please contact Nikki Carritt, Deputy Director & Program Manager for the Nebraska AHEC Program. To meet the state's health and health workforce needs. The Nebraska AHEC Program provides educational programs and services that bridge academic institutions and communities to improve the health of Nebraskans with a focus on rural and underserved populations.